Removed LibreCAD via terminal. Installed version 2.1.2 via terminal. LibreCAD installed, however, HATCH BUG remained. 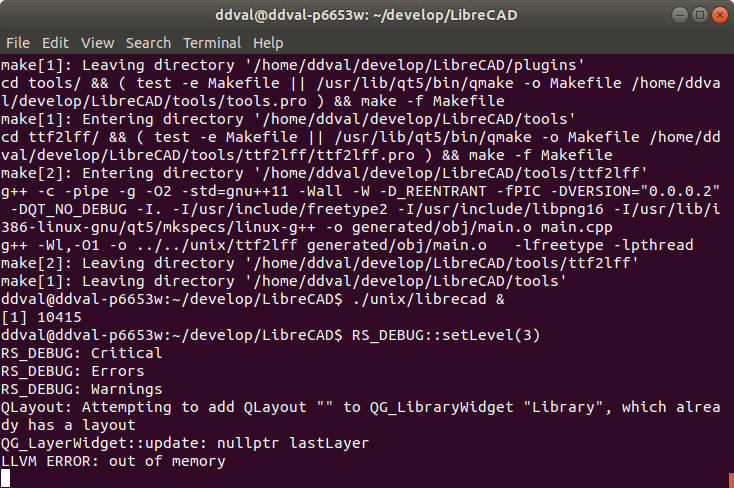 Brought LibreCAD up on terminal. Tried HATCH application, NO SUCCESS. The following bug data produced via terminal. Deleted all LibreCAD work. Work removal did not cure the HATCH BUG. Out of memory error cannot refer computer memory. any body have any ideas???? I just can say it works for me, I don't have that bug on LibreCAD 2.1.2 in PuppyLinux Bionic Pup 32, which uses the Ubuntu repositories. So the reason may lie outside of LibreCAD. Or is 2.1.2-1 much different? You could try a different OS or a different computer. Thanks for your input dellus. I've failed to solve the problem with Ubuntu and libreCAD 2.1.2, I downloaded and compiled source code version 2.2.0 from GitHub. The same crash problem exit. The out of memory error message is a mystery. The hp that runs Ubuntu has several Gigs of memory. Also, the hard drive is triple booted Ubuntu 16.04.2; Mint 17.5 Rosa and Windows 7. Mint and Windows run different versions of libreCAD with no issues. Attached is a terminal screen shot of the 2.2.0 Hatch Crash. Spent to much time on this. I'll look into Sketch-Up for this machine.